MVP Puck Label - Stinky Lockers Ltd. Brand your tournament with your own custom tournament MVP or Player of the Game puck label. 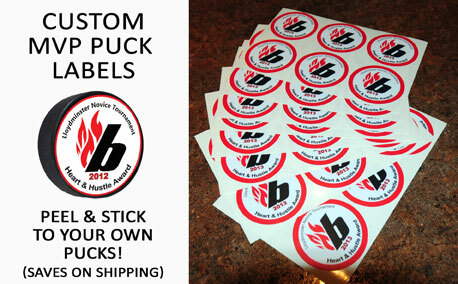 We'll send you the labels and you can apply to your own pucks & SAVE on shipping. Contact your local sporting goods store and they will often give you branded pucks for free with their logo on one side and then put the label on the other! Looking for a tournament MVP award? Order 10 or more and the price is only $ 3.95 each! Otherwise, blank pucks often sell for only $ .99. Hosting a tournament? Let us customize your own tournament puck label. No set-up fees!